I’m covered in hex code. we are the machine : left of spine : we are all interconnected, and through that interconnection, we become self-determining. Death is the road to Awe : left of that : As a transhumanist, it is important to remember that the tear-down is a necessary part of every cycle – you cannot keep building and building. all else will follow : lower line around right shoulder : full line is “just breathe, all else will follow” – it reminds me to chill out. then the ruins began to sing: wrap up right side : the inorganic infrastructure we build and subsequently abandon takes on a life of its own. Be responsible in what you create and how you treat it – it lives beyond you. 09 F9 code : upper line around right shoulder : you’re trying to control information with information – I don’t think you understand how this works. becoming all that I am : up to right shoulder : everything you experience makes you who you are. While parts of life have been terrible, I like who I am now – and I can be even better. a way for the universe to know itself : curly to left shoulder : sentient beings made of matter?! wtf, universes. So cool. Transit Map overlay of cities which have been important and informative to me: Berlin, Boston, London, San Francisco, Seattle. Throw away the scabbard : left forearm : We work for peace for as long as we can, but when the time comes to fight, we draw our sword and throw away the scabbard. A beautiful quote said by many, including a horrible person, as a reminder that we can learn from the people we are against. The first two were done at Big Red Tattoo in Bloomington, Indiana. The subsequent code, heart, and map have been done by Aaron Campbell, previously of Laughing Buddha and now at Action Tattoo. And yes, apparently this was featured by Carl Zimmer over at National Geographic. 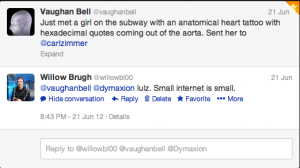 Which came about as a hilarious happenstance of @dymaxion seeing that @vaughanbell had run into me on a subway in NYC, making sure I actually followed up with @CarlZimmer. The left leg and shoulder pieces were done by Santa Perpetua out of Black Sail Tattoo in Brighton, England. preguntando caminamos : down left calf : roughly translates to “asking, we walk.” A reminder to both examine, but still move forward. !Ya Basta! : down left calf :a rallying cry to unite many different groups. mandar obedeciendo : down left calf : roughly translated as “lead by obeying” — True leaders follow the will of the people, the desires of the larger community. As seen in Total Tattoo December 2015. As seen in Skin Deep May 2016 and Tetovani March 2016.